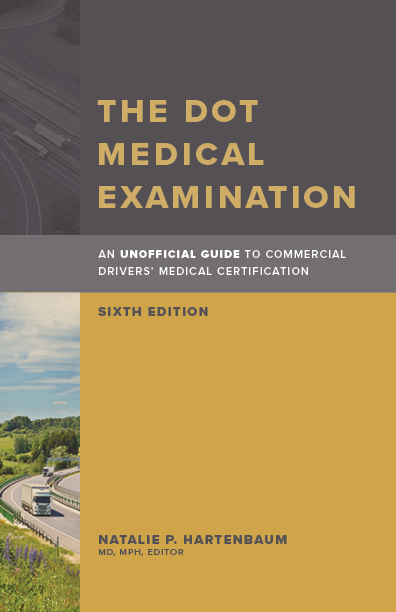 The Essential Resource for DOT Medical Examiners -- Thoroughly Revised and Updated! Available as a package only (Print version and eBook). The eBook version will be updated at least twice per year to keep you abreast of future changes in regulations and recommendations. First published 20 years ago, this now classic guide to the DOT medical examination has been thoroughly revised and updated. The Sixth Edition collates the most recent "official" guidance from FMCSA, recommendations from FMCSA advisory groups (that have not been formally adopted), and the medical literature, and clarifies many of the confusing issues that have arisen from the NRCME. Please note: This book is not downloadable. Important: This item is an OEM Press exclusive and is not available through third-party vendors.